As the winemaker behind Overhex Wines International’s expansive portfolio, Ben Snyman is a very busy man. More than 7,000 tons of Overhex’s wines are exported to 47 countries worldwide, and as chief white winemaker, he’s in charge of the lion’s share. The Worcester winery is one of South Africa’s top 10 exporters. Their Swartland range, Survivor, is Snyman’s pride and joy – specifically, the Chenin Blanc, which has won accolade after accolade since its maiden release in 2014. In April, the Survivor Chenin Blanc 2016 was announced as one of only four Chenin Blancs to score a Top 100 place at the National Wine Challenge. It’s already achieved a Top 100 rating, scored 4½ stars in the Platter’s Wine Guide, rated 91/100 by the internationally acclaimed Decanter Wine Magazine and included in the South African Airways (SAA) Wine Listing. It’s a great start for Snyman, who graduated with a degree in viticulture and oenology in 2009 at the University of Stellenbosch. The following year, he did a harvest season at Chalk Hill in the renowned Sonoma Valley in California, where he says he accumulated immeasurable experience. He’s also done harvests at Vrede en Lust, Boschendal and a range of other prestigious estates. 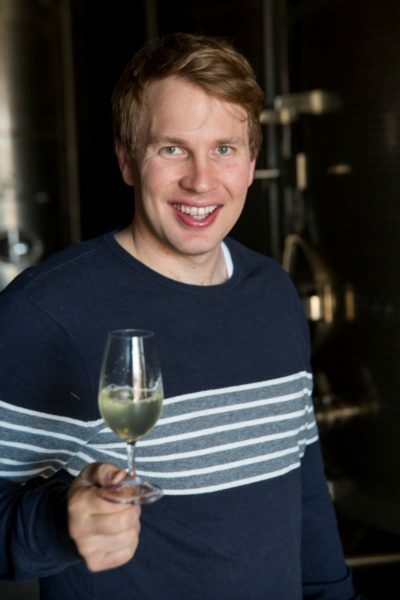 Snyman was appointed winemaker at Overhex Private Cellar in 2010 – last year, he was promoted to head winemaker at the cellar, which is part of Overhex Wines International. Achieving such recognition for the Survivor Chenin Blanc is certainly a splendid achievement. But Snyman only realised his passion for wine while already at university when he had an epiphany – brought about by youthful curiosity. “During my studies at the University of Stellenbosch I stayed in a small apartment on campus. I loved cooking and enjoyed a glass of wine with it. One day, I decided to mix different varieties together in my glass (being on a student budget). I was quite intrigued at what I’d created and how one can manipulate flavours and harmony with wine – just like you do in cooking. I decided that day I wanted to become a winemaker,” Snyman explains. Of course, it wasn’t as simple as mixing wine, which he soon realised. “Winemaking is not just about making wine. It’s also about how you can involve and educate others about wine. His first international experience was an eye-opener because he realised it wasn’t only about the wine: “I wanted to increase my exposure to New World winemaking techniques internationally. During my season in Sonoma I shared a house with people from Germany, Greece, America and Portugal. What I’ve gained was far more than learning new techniques – it was a cultural experience too. What’s next for this young winemaker at Overhex Wines International?